Vice President Retired General Dr Constantino Chiwenga is in Kinshasa for the inauguration of the DRC President-elect Felix Tshisekedi, where proceedings are underway. Tshisekedi is being sworn in as the President of the DRC, following the December 30 harmonised elections. The President-elect surprised many when the over 60 million Congolese put their trust in him, winning over 38 percent of the vote, beating two other fierce contenders, Mr Martin Fayulu and Emmanuel Ramazani Shadary from Kabila’s party. 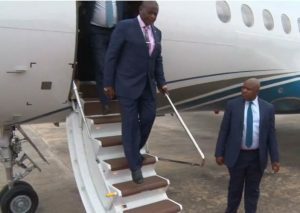 Earlier, the Vice President was seen off in Harare by Vice President Kembo Mohadi, several cabinet ministers, service chiefs and senior government officials. Dr Chiwenga is accompanied by Acting Foreign Affairs and International Trade Minister Ambassador Cain Mathema, senior government officials and DRC ambassador to Zimbabwe Mr Mwanananga Mwawampanga.